The Cyprus Hotel Association is pressing MPs to pass a bill regulating Airbnb type rentals that has been on the table for nearly a year to combat what hoteliers consider as unfair competition. HOTELIERS are pressing for legislation to be introduced that would regulate tourist accommodation booked via sites like Airbnb, as they deem it ‘unfair competition’. With competition between hotels and Airbnb accommodation in Cyprus on the rise, the Cyprus Hotel Association (CHA) is calling on MPs to pass a bill which has been on the table since May 2018. 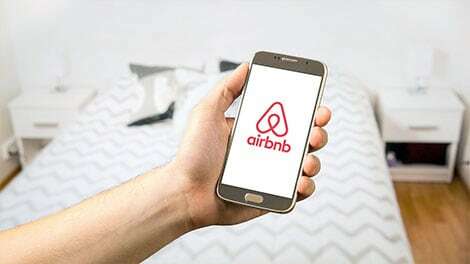 The proposed legislation tabled by ruling DISY leader Averof Neophytou and EDEK MP Elias Myrianthous want Airbnb-listed accommodation included on a register, subjected to tax, while obligated to undergo health and safety inspections. Cypriot MPs told the Financial Mirror that they are aware of the urgency of the matter and are “putting the final touches to the legislation before bringing it before the plenary”. The bill is currently being discussed at the House Commerce Committee, with MPs scrutinising the finer details. “An issue raised by fellow MPs who argued that apartments on platforms such as Airbnb, could only be included on an official register if owners have the approval of other residents in the building, has been overcome. “We have agreed on a formula with which owners of such flats will need the consent of the building’s management committee, before letting them out,” Myrianthous said. He said the legislation will enable the state to monitor and perform health and safety checks on these types of accommodations, while owners will be subjected to tax. EDEK’s Myrianthous had said in October, that the state is losing revenue that it could receive through licensing rights stressing that some 40,000 properties are not licensed. He noted that there are around 20,000 illegal villas and dwellings, with most owners interested in acquiring a license. According to official data, hotel beds in Cyprus amount to 83,000. It is estimated that one-third of tourists arriving in Cyprus seek accommodation in non-registered units. Talking to the Financial Mirror, Zacharias Ioannides, director general of the Cyprus Hotel Association said that legislation must go ahead as soon as possible as hotels have made serious investments. According to data provided by the land registry in October, new hotels, refurbishments and expansion projects have multiplied by eight times in the first seven months of 2018, compared to the same period in 2017. From January to July 2018, hotel projects covering 83,000 square meters were licensed, compared to just 10,000 sqm in 2017 – the 730% increase also accounts for one-third of the licenses for new building projects. “Expected investments in the hotel industry include the construction of new hotel units island-wide while existing hotels have increased their bed capacity and upgraded their services,” said Ioannides. He said that investments in question were made in order to meet demand created by the increase in the number of tourists arriving in Cyprus, however, hoteliers feel that owners of apartments should be on a level playing field. “Hoteliers who have significantly invested in upgrading their product and pay a significant amount of taxes to the state are currently subjected to strict regulations, while Airbnb has been excluded so far from these obligations,” Ioannides told the Financial Mirror. Acknowledging that accommodation options offered by platforms such as Airbnb and Booking.com are a global trend, Ioannides added that the market should, however, be regulated so as to do away with unfair competition especially at a time when Cyprus tourism is under pressure from rival destinations. He argued that regulating the Airbnb market is also important as it would introduce safety and health checks for accommodation which currently is not obliged to follow any rules. “We are not opposed to modern trends, but we claim legitimacy and defend the rights of hundreds of businesses that have been working for decades under adverse conditions, trying to maintain a high standard in the tourist services,” said Psilogeni. Meanwhile, Airbnb has the potential to benefit Cyprus tourism says an academic who has been monitoring the platform’s performance in Cyprus. UCLAN lecturer in Innovation and Entrepreneurship Fanos Tekelas said that while the island’s tourism is under pressure from competition from cheaper destinations in the region such as Turkey and Egypt, tourist accommodations promoted on platforms such as Airbnb can attract tourists who prefer to spend more on activities during their holidays rather than on accommodation. “We are not a cheap destination. There are no sponsored packages for tourists heading for Cyprus, while other destinations in the region have cheaper airfares and lower accommodation costs,” explained Tekelas. Understanding that this type of accommodation is in competition with hotels who have spent millions in renovations and upgrades, Tekelas said that tourists opting for Airbnb accommodation, are not attracted by five-star hotels, but rather are looking to spend their time and money creatively. “On the negative side of things, a number of Airbnb accommodation owners live overseas, and that might not only pose as a tax challenge but also see revenue otherwise set to stay within the country, find its way abroad. The only way to totally do away with tax evasion and loss of revenue is to ban such platforms in Cyprus entirely. That I believe would prove disastrous for our tourism,” said the UCLan lecturer. Acknowledging that owners of such accommodation have a lot of scope for tax evasion, Tekelas suggested that all such accommodation should be subjected to a yearly license fee, rather than being taxed on the number of tourists accommodated or rooms. According to the Airbnb platform, visitors who used short-term lettings in Cyprus reached 120,000 from 125 different countries in 2017-2018, while this number is expected to rise significantly. It’s a joke that HOTELIERS are pressing for legislation to be introduced that would regulate tourist accommodation booked via sites like Airbnb, as they deem it ‘unfair competition’. What is good for the goose is equally as good for the gander. What about them offering all inclusive and the restaurant and other eating out places said that business is not as good since tourist paid for an all inclusive, they are not eating out at other restaurants. They should not offer so many all inclusive to give restaurant a change to get customers. Should all restaurateur press for legislation to stop hotels from offering all inclusive to be fair to other businesses? I think hoteliers will not agree. It’s fair game in all businesses, you win some you loose some. Hotels advertise on a big scale whereas small restaurants don’t or have the finance to do so. So you need to look into this more carefully. What will CHA do next, stop private owners from advertising in other site like Booking.com, Trivago, Owner Direct and so on. Also what happens in the winter when a number of hotels are closed. CHA got to think very carefully so as not to loose tourist who prefer to stay in private accommodations and there are lots of them them. So they’ve blotted-out the landscape with concrete towers and now want to blame someone for lack of punters. That doesn’t mean I agree with bnb evading taxes. But no sympathy at all for greedy hoteliers who need to do their homework. What made Cyprus into an attractive destination in the beginning? Mmmm…. From experience of our complex that is 50% owned by Brits many of them are renting out their apartments because they cannot sell their apartments due to them being unable to sell their properties due to having no deeds. Its all very well CY creating yet another new law to go with the ridiculous ones such as having a life guard on a private complex and so on when they cannot even enforce the law that the country has to give us our deeds. Most of us have quite large amounts of money owing to developers on delivery of those deeds that we could all use to pay unpaid taxes that so far have been unpaid by our developers who are now bankrupt ! !In typical style CY chooses to apply the EU rules that it thinks will earn them money and ignore the ones that don’t suit. The place is a joke, corrupt and not worthy of its EU status. What they really mean is: Please ban something that means we have to work harder against natural competition. When the Cyprus economy hit the fan a few years ago – a local restaurant put their prices UP. When asked why – we got the following response (100% true) . Actual quote: “We are taking less covers, and getting less bookings, therefore if we are to make the same money – we must increase prices”. We counter: “But if you come up with some form of incentive or deal – you’ll increase your covers. Silence…….”But we are selling less – therefore we must put up the price”. There you have it. The Cyprus mind-set … in a nutshell. As an apartment owner Air Bnb has been a life saver not only for people like us but for local restaurants. A couple of years back with the all inclusive deals the small village restaurants were empty. Now there is an atmosphere back. We too have invested like the hotels and bring a lot to the Cyprus economy. Hotels talk about it being unfair competition. They just don’t like competition. Aren’t these the same hoteliers that were moaning a month ago about not being able to employ enough trained staff to properly service the number of tourists they already have? Also, how many hotels have the proper licenses now, and how many of them have been illegally built using the usual unfair brown envelope method? Before the Government even thinks about legislating the private accommodation market, they need to get their hotel industry properly regulated and licensed. Funnily enough I am in such an accommodation right now having spent Saturday and Sunday in Paphos. All meals, drinks and coffees have been taken out. On Friday afternoon I return for a 3 night stay in a hotel and the cost is almost prohibitive. A package deal from Germany, UK or France would be cheaper including flights and for longer so if hoteliers wish to complain about others trying to make a living in order to protect their cartel then consider your pricing is not reflective of the quality and infrastructure of the resort. AirB&B, Booking.com, Trivago etc. offer accommodation via privately owned properties as well as commercially owned multi-unit short term rental properties. Their client base consists of couples like me and my wife that do not want to use a resort or a hotel, whether all inclusive or not. We are independent travellers that prefer to relax in an apartment (rather than a room) with a nice balcony with a view, its own well equipped kitchen and to come and go on our own schedule and not a hotels. Not only do we prepare some of our own meals (which means that we buy a lot of food, wine etc from supermarkets, green grocers, bakeries, butchers etc we also usually are out and about during the day and so use restaurants for lunch and dinner. On top of all of that we are visiting tourist sites/places of interest and shops, spending money. IF Cyprus decides to limit and reduce the options for us as tourists, we will simply go elsewhere. Cyprus’ towns, villages and regions are just one of literally tens of thousands of places in the Mediterranean (never mind the Black Sea,Caribbean, North America, Asia, Australia etc) where we can stay, enjoy the culture & food and most importantly as independent travellers, do what we want to do and stay where we want to stay. If the Cypriot government is so silly as to interfere with the “independent tourist” industry by their ill advised restrictions/limitations on privately owned apartments and villas then they had better be prepared for the short term and long term consequences : we will no longer visit/stay in Cyprus with the inevitable loss of income to Cypriot businesses and loss of taxes from the money spent in Cypriot businesses and on Cypriot services. The Cypriot governments actions will inevitably increase the cost of private rental units to tourists making them uncompetitive. Literally, you could be speaking of billions of Euros of lost income and taxes !!! Never mind the Hotel Associations selfish/self-interested attitudes, the other business associations need to take onboard the reality of the major losses their members will suffer and the over-all effect on the Cypriot economy. Cyprus is part of the Worldwide tourist industry and it cannot operate in its own “little bubble” or that bubble will be burst !!! Once you lose tourists, they rarely come back.